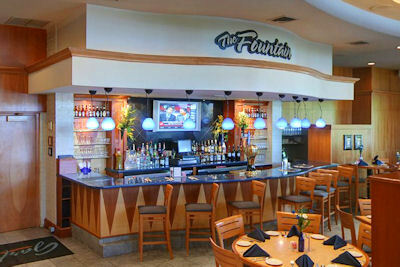 For a relaxed, satisfying meal in a casual, friendly atmosphere, try Garfield’s in the Eden Resort & Suites. Garfield’s offers a family-friendly, smokeless atmosphere and serves good food at reasonable prices. Mainstay menu options include ribs, burgers, and sandwiches, plus daily menu specials and regular favorites such as Pasta Fresca and Broiled Crab Cakes. See their full menu online. Garfield’s also offers their daily luncheon and dinner buffet selections – all you can eat of fresh salads, soups, pasta, entrées, and dessert. Call ahead seating is available. Simply call 717-569-5454. Garfield’s is open daily 11:30 am – 10:00 pm. Their luncheon buffet is Monday – Saturday 11:30 – 2:00. Dinner buffet hours are Friday – Saturday 5:00 – 9:0 pm, and Sunday 11:30 am – 2:30 pm. For casual Lancaster dining, good food, and a friendly atmosphere, try Garfield’s. Regular customers can save 25% on their meals by joining the Eden’s Platinum Club. Club members save on meals at Garfield’s, Arthurs Terrace, the Encore Lounge, and on the Eden’s fabulous Sunday Buffet. Find out details here. Voted Best Hotel in Lancaster...again (Lancaster Newspaper's Reader's Choice Award.) Within minutes of Amish farmlands and outlet shopping. 301 superior guestrooms, including 1-, 2-, and 3-bedroom suites - some with full kitchens. Indoor and outdoor pools, 2 restaurants, lounge, fitness center with locker rooms and sauna, tennis, basketball and shuffleboard courts. Visit website.